In 1989, a simple joke stencil created by a teenage skater and aspiring street artist changed the face of art and fashion. The stencil, originally created only to teach his friend about the art of stencil making, depicted the leering visage of popular pro wrestler/actor André Rousimoff (aka André the Giant, Eighth Wonder of the World) beside a caption declaring the gargantuan strongman’s billed physical statistics and the claim (or warning) that a posse backed him. Unexpectedly, said image went on to capture the imagination of people outside of his personal friendship circle (its intended audience). Seeking to simplify the original design, the boy stripped it back to its bare essentials and removed the detailed caption, replacing it with a single word: Obey. This boy was artist Shepard Fairey, whose work can now be seen in exhibits at the Smithsonian, the MoMA and the Victoria & Albert Museum, and whose career-making image and slogan can be seen scrawled across the clothing of skaters, hip-hop fanatics and fashion aficionados everywhere. No longer confined to street corners, the Obey icon – now possibly the defining image of contemporary street culture – has been available on t-shirts, sweatshirts, jackets and snap backs since 2001 and from September 2013, all are available for purchase via the Urban Outfitters website. Aside from the requisite face logo, highlights of Urban Outfitters’ debut Obey range include: the Wet Lips design, which is available on a white t-shirt or black sweater; the Bird Records design, featuring a graphic of a vinyl record with Obey Records listed as the imprint; and War Is Murder, an explicitly political graphic print typical of Fairey’s street art, which bears the image of a military helmet-clad skull exhaling a mushroom cloud plume from the end of its cigarette. 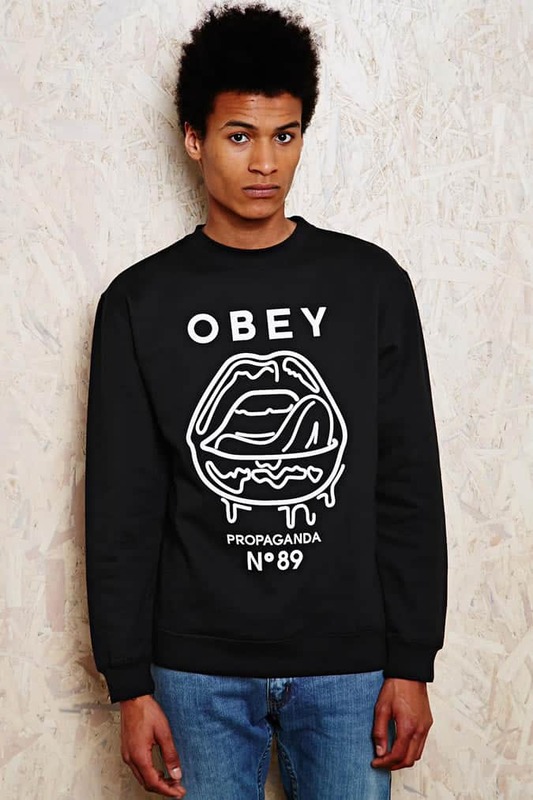 Obey clothing is on sale at Urban Outfitters now.